In this 24 Hours to Hell and Back episode, Gordon Ramsay visits Catfish Cabin in Memphis, Tennessee. The restaurant was opened in 1971 by owner Charles, his daughter Rachael later became the manager. The pair argue constantly and Rachael clashes with General Manager Geraldine also. Rosie is the Head Chef and has worked in the kitchen for over 15 years. Gordon arrives at the restaurant in disguise a construction worker with other local construction workers. He notices that the decor is very outdated and there is a smell in the dining room. They order staple Memphis dishes including hush puppies and catfish as well as a burger. Gordon's table wait over an hour for their food and are disappointed when it arrives. The hush puppies are oily and greasy, the hamburger is under cooked and disgusting and the catfish is slimy. Gordon removes his disguise, tells the customers to stop eating and asks the kitchen staff to come into the dining room. From there he takes the staff and customers to his Hell on Wheels truck where he shows them hidden footage. The footage reveals a filthy kitchen, cross contamination of food, cockroaches and rotten carcasses left on the floor. Gordon asks Rosie about her cleaning regime and also blames Geraldine. Gordon talks to Rachael who tells him that Charles tells her to be in charge but she isn't allowed to do anything. She tries to talk with Geraldine but she is just ignored. The staff feel like the issue is that the management is split. Geraldine gets defensive when Rachael tries to help and the customers can feel the tension. Despite Geraldine being the General Manager Rachael deals with all of the official business including the finances. The renovation team decide that they want to rip everything out and start again. The staff are tense and there are tears and tantrums, especially when Gordon inspects the kitchen. He finds rotten meal and fish, uncovered and unlabelled produce and dangerous pools of oil. Hr calls the floor a cockroach duvet as it is a breeding group for them. Charles walks out but Rachael begs him to come back. The kitchen team deep clean the kitchen. 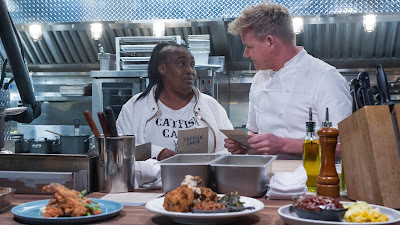 Gordon takes Rosie over to his Hell on Wheels truck to learn the new menu. Her passion for cooking quickly returns whilst working with the fresh produce. Gordon meets with Rachael as he wants her to run the business but she says she can't whilst Geraldine is in post. Gordon quizzes Charles as to why she was brought in and he won't let Rachael lead. Gordon shows some hidden footage of Geraldine taking cash from the register for business costs but there is no evidence of how much and for what it was taken. Rachael fires Geraldine, due to both this and the fact that they cannot work together. She calls the staff together to tell them that Geraldine is gone and they are pleased that they will have one manager. The Chefs are learning the new menu in the Hell on Wheels truck but progress is slow as they are not used to working to recipes with fresh produce. They are shown the new kitchen with new equipment including a new fryer. Gordon asks them to cook the new menu with the new fryers and they under cook the chicken. For relaunch, the team are given a pep talk from Gordon. A chicken order is returned to the kitchen as raw and the service falls apart as it is once again returned as raw. Rachael breaks down in her office and Rosie is annoyed. After another pep talk from Rachael Gordon steps in and helps the kitchen get back on its feet. Despite the hitches the relaunch is a success and the customers love the new food and decor. What Happened Next at Catfish Cabin? Three months later and their sales have improved. Charles is grateful for their help and Rachael is leading well as the Manager. The staff are more positive and communication has improved. Catfish Cabin is open. Reviews are very mixed after the show, negative comments focus on poor customer service and poor food items including mac and cheese. The hush puppies and catfish often receive high praise. They have responded to reviews citing that they are working on the consistency. Catfish Cabin was aired on January 23 2019, the episode was filmed in November 2018 and is 24 Hours to Hell & Back season 2 episode 4. As filthy as that restaurant was, I have to ask: Does Memphis not have a health department? Apparently not. It makes me wary of eating in any mom and pop restaurant in the area without inspecting the kitchen myself first. It was disgusting.